As the name implies, a grow tent is a “portable, reusable grow room.” Typically it will be constructed of sturdy canvas, sporting a reflective interior that boosts the effectiveness of grow lights. The tent offers insulation for heat retention, along with ventilation for temperature management. Why do you want one? For one thing, a grow tent offers the prospect of year-round farming. It’s weather-safe and light-proof, effectively shielding your crop from outside elements. 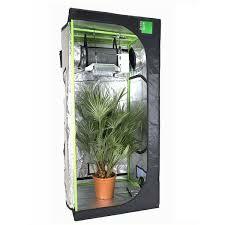 Because it is an enclosed environment, a grow tent allows you to more finely tune your growing parameters. For the indoor grower, a tent may offer big advantages over a growing room. As a freestanding structure, it allows you to create a growing area without drilling or cutting holes into walls and ceilings. A lipped bottom keeps excess water from damaging floors. As such, “grow tents have far less of an impact on the interior of a home than retrofitting a room does,” according to Maximum Yield. Grow tents let you use space wisely, as they can be readily configured to a range of sizes. They’re enclosed, which helps to keep pests out and allows you to better manage environmental conditions. To make the most of the benefits of grow tents, it makes sense to leverage technology. Monitors, meters, software and smart management tools all can help a grower to gain best advantage from a tent growing system. Analysts predict that the market for certain types of farm technology will climb from $748 million in 2016 to over $1.9 billion by 2023. The demand will be driven in part by a range of farm management software tools. These include production management tools, bookkeeping aids, recordkeeping applications and other time-savers. For the tent grower, some of the most promising advances come in the form of cloud-supported Internet of Things (IoT) solutions: a rising array of sensors, monitors and data-driven intelligence tools that can help to fine-tune the growing environment. These solutions can allow a grower to gain a high degree of precision in areas that are key to the agricultural cycle, areas that in the past have been too often left to chance, guesswork and intuition. Take, for instance, water use. Historically this has been a combination of skill and luck. With modern sensors clocking data in real time and automated systems acting on that intelligence, it’s possible to optimize water use by reducing overwatering, underwatering and run-off. Nutrients and pH levels can likewise be managed with a higher degree of scientific precision than ever before. Sensor-driven equipment can not only record soil conditions, but also make automatic adjustments for optimum growing. Environmental sensors for temperature, humidity, CO2 and light all come together to forge an unparalleled growing environment. Tent growers also can benefit from the remote management capabilities inherent in the latest technologies. New tools allow remote monitoring and even give growers control over their crops when they can’t be physically present. Alerts can let an off-site grower know when potential issues arise. While such tools may also benefit a greenhouse grower or a farmer in the field, the tent grower may see special benefit here. The tent, after all, is a microcosm, an enclosed environment in which all the agricultural variables are contained and manageable. Smart sensors and the evolving world of IoT offer a way for growers to take full advantage of this environment for maximum yield and maximum productivity.